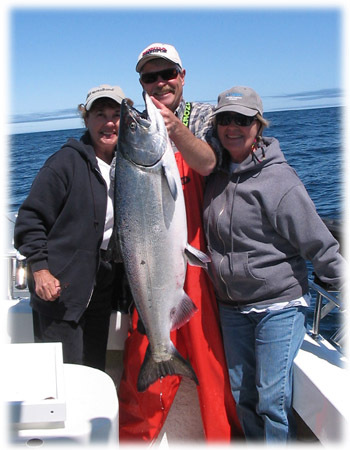 Fishing in Eureka, Humboldt County is more fun with Reel Steel Sportfishing Charters. Go fishing for Halibut, Salmon, Tuna, Rockfish, Lingcod, Crab or Sharks off of the beautiful Redwood Coast. With over 30 years of ocean sport fishing experience from Fort Bragg, Shelter Cove, Eureka, Trinidad and Crescent City, Captain Tim Klassen will take you to the fish. We provide custom fishing trips for individuals or groups up to 6. All tackle, bait and even hot coffee are included. Our goal is to provide you with a memorable fishing experience. We have the flexibility to serve novice and experienced anglers alike. Get seasick? You can fish the calm waters of Humboldt Bay for California Halibut or Sharks and Rays. For the more adventurous, travel to the lightly fished waters of Cape Mendocino on the Lost Coast for Rockfish or head offshore for Tuna. Copyright © 2008 Reel Steel Sport Fishing. All rights reserved. Web development by Page Weavers.